Last week, I introduced a new build of Temur Delver that runs black for Death’s Shadow, the Avatar’s partner-in-crime Thoughtseize, and Modern’s shiny new removal spell, Fatal Push. With another week of experience testing under my belt, I have plenty more insights on the deck. This new experience has inspired a few changes to Temur Shadow, and even a new build that forsakes red. For reference, here are the changes I made since last week. The most efficient threats in a given format are often bound to produce some tension. Wider card pools tend to eliminate this tension—Canadian Threshold, Legacy’s most iconic protect-the-queen deck, runs an elegant creature suite of Delver of Secrets (which works in a 12-creature deck), Nimble Mongoose (which rewards players for playing Magic), and Tarmogoyf (which does the same). Modern tempo decks don’t enjoy such a luxury, as the format’s card pool lacks the variety necessary to have a perfect creature suite. 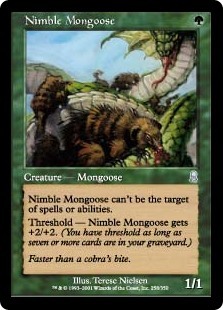 For example, Monkey Grow ran Hooting Mandrills alongside Tarmogoyf and Snapcaster Mage, and the three sparred amongst themselves over the graveyard. Counter-Cat ran Wild Nacatl, a creature at its best alongside many other creatures, together with Delver of Secrets, a creature at its best in a creature-light shell. Temur Shadow runs Delver alongside Death’s Shadow, who comes with his own deckbuilding restrictions. Delver requires pilots to construct decks running 25 or more instants and sorceries. Shadow, on the other hand, functions best alongside certain cards. Thoughtseize happens to work with both Shadow and Delver. Street Wraith complicates matters gravely, limiting the number of creatures Delver pilots can work with. Additionally, if one of the draws to green in Death’s Shadow decks is Traverse the Ulvenwald, deckbuilders are incentivized to dip into even more noninstant, nonsorcery cards, like Mishra’s Bauble. The resulting tension between Delver and Shadow manifests itself in a couple of ways. One issue I encountered with Temur Shadow was dealing myself enough damage for Shadow to come online. Against damage-light decks like Ad Nauseam, Tron, and even UW Control, I found myself unable to accelerate into respectable Shadows consistently. I needed to draw three fetchlands, plus a Thoughtseize or a fourth fetch, to turn Shadow into a clock, and by then it was sometimes too late—my opponents had assembled their combo or stabilized, and I hadn’t dealt enough damage with creatures to close out the game with reach. Of course, simply adding a set of Street Wraiths isn’t really an option in a deck with Delver of Secrets, especially if we want room for Delver himself and other creatures like Goyf and Snapcaster. But Mutagenic Growth, the only other excusable self-damaging card available to us, does far too little here. Another issue I ran into was turning on delirium against the same linear decks. Strategies that don’t remove our Delver complicate reaching four card types for Traverse the Ulvenwald, to say nothing of games in which we don’t draw Delver at all. Nothing feels worse than clunking out on Shadows at 14 life as opponents cycle Chromatic Stars. Again, we can only add so many Baubles and Wraiths to the deck before going under 25 instants and sorceries for Delver. We could run a third Tarfire, but the card does so little against certain strategies (including these linear decks we’re adjusting for in the first place) that it strikes me as an underwhelming fix. The first fix was to add a second Temur Battle Rage to the main. Rage has a few applications against fair decks, too, like blowing through blockers and providing a pre-board out to Lingering Souls. But its biggest strength is letting us shave a turn off the clock against linear decks, which rarely have ways to interact with our big attacks. Next, I added Street Wraith to the main. Extra Baubles didn’t appeal to me as a delirium enabler because we never want to draw it in multiples. Wraith also helps with the self-burn problem for Death’s Shadow. We can even Traverse for it to rush Shadow out, which some game states call for. It’s possible we want to run Wraiths over Baubles entirely, but I like making sure my Goyfs can beat Tasigur and Smasher in combat right now. To make room for these new additions, I cut a Shadow, a Traverse, and Kolaghan’s Command from the mainboard. Shadow and Traverse are each clunky sometimes, and Traverse generally serves as another copy of Shadow in the late-game anyway. With Serum Visions, we don’t need to lean as heavily on searching. Command was often underwhelming in my testing. I liked the idea of having an out to annoying artifacts in the deck, but that mode very rarely came up pre-board. We grind just fine before siding and have Bedlam Reveler after. Meanwhile, Command is abysmal in linear matchups, generally reading Raven’s Crime plus Shock (with entwine 1). I also streamlined the sideboard. Threads of Disloyalty has a pretty high ceiling but I think it’s just too cute. Against non-Goyf decks, it always disappoints; even against Grixis Shadow, we’re not always guaranteed to have a target. Tasigur, the Golden Fang and Gurmag Angler avoid Threads entirely, and just the thought of stealing Snapcaster Mage makes me cringe. Collective Brutality went to 3 for some help against Burn and control, and Anger of the Gods was split into Kozilek’s Return and Engineered Explosives. The former is usually just as good and has extra applications against Affinity and Merfolk, while being much easier to cast, and the latter is just incredibly versatile. It wipes fields loaded with tokens, blows up Chalice of the Void for two mana, and sometimes even kills a pair of Shadows or Goyfs. Adding Explosives also lets us cut a Revelry, as we have more outs to problematic artifacts and enchantments. Another idea I’ve been toying with is abandoning red altogether. Doing so makes our mana much better and allows us to focus down certain elements of our gameplan, such as growing Death’s Shadow, since we won’t have to worry so much about other elements. Losing red means losing Tarfire, so I think it’s correct to omit Traverse the Ulvenwald from this kind of build. Taking its place is Sleight of Hand, an underrated, get-it-now cantrip that also enables Disrupting Shoal. Sultai Delver plays closer to the original Monkey Grow than Temur Shadow does, even without Lightning Bolt. Fatal Push does a fine impression of the red instant in most matchups, and the plan of cheap fatty plus Disrupting Shoal plus Stubborn Denial still lines up very well against Modern’s many linear strategies. Besides, Lightning Bolt is worse in Modern now than it has been in what feels like forever, since it hardly affects the format’s best deck. 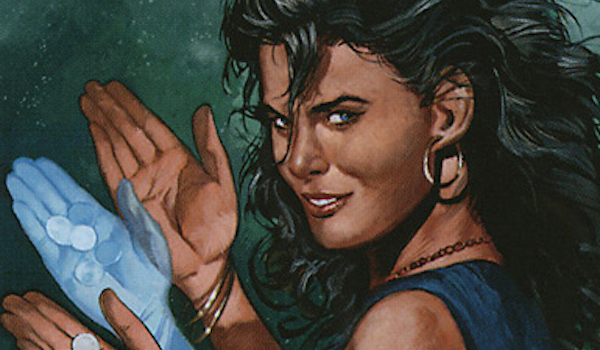 We do miss the reach in racing scenarios, but our ten counterspells come in handy there, too. Disrupting Shoal is the standout card in this build, serving as an answer to the most-played removal spells in Modern: Fatal Push and Path to Exile. Outside of these answers, few cards can actually remove a huge threat. Since Push and Path only cost one mana, Shoal’s practically a lock for hard-cast countering them in the mid-game. Shoal also gives us a notable edge in the mirror. We do run a little low on blue cards here with only 23, but that’s still above my proposed cutoff for the card, and it helps that the four Wraiths immediately cycle into the next card. Gitaxian Probe, how we mourn thee! The last point I’d like to touch on is the inclusion of eight blue cantrips. Naturally, the cantrips help support Disrupting Shoal, but they also give us a level of blanket consistency that Jund, Temur, and Grixis Shadow decks can’t lay claim to. Traverse is better at finding specific creatures, but Sleight and Serum allow us to dig for powerful draw spells like Painful Truths or planeswalker bullets like Liliana, the Last Hope. For the record, I don’t think Sleight’s effect is nearly as powerful as Traverse’s. But between how much less effort it requires to benefit from casting a Sleight of Hand, and the upside that it guarantees us the best card in our top two, the spell has impressed me thus far. Michael Majors took to Star City Games last week to outline “The Many, Many Colors of Death’s Shadow.” There really do seem to be an infinite number of ways to build with the Avatar, as there are many ways to build with Tarmogoyf. To me, Delver of Secrets seems poorly positioned against Death’s Shadow Jund (as it turns on their Tarfires) but advantageous against the other Death’s Shadow decks, who lack efficient answers to the flier outside of Fatal Push. Time will tell if a Delver variant becomes Modern-viable, despite the tension Delver has with Death’s Shadow. Either way, I’ll keep trying my own hand at it! Next Post: Finance 101: What Is Risk? Sultai delver doesn’t seem very good to me. You’re DS jund with no way to pull ahead in card advantage (lili/command) and less copies of good threats (delver instead of traverse) plus your new threat delver is vulnerable to bolt so youlose DS Jund advanage of being mostly bolt proof. You gain stubborn denial / leak but basically in place of tarfires and inquisitions that are as good or better 90% of the time. DS Jund can go to topdeck mode and hope to draw goyf, shadow, traverse, lili, kcommand, or sit on a reactive card like tarfire. The dead draws would pretty much just be the discard. Sultai Shadow… you go to topdeck mode and all you hope to draw are goyf/shadow – or maybe a sleight/vision to get another chance at a goyf/shadow. So you hope to stick a threat and protect it I guess – except you will run out of cards very fast trying to shoal everything, and by turn 4 mana leak does nothing vs path/push for the most part. If DS Jund didnt exist maybe I’d see something here – but this just seems like a worse game plan in every conceivable way. http://tappedout.net/mtg-decks/whiteless-deaths-shadow/ Started from your original 4 color list and found Delver to simply not be very strong and to cause too many issues with achieving life loss necessary to deploy a timely death’s shadow. Getting to simultaneously grind out with snap caster mage while still having a working traverse package is incredibly strong. The main problems I’ve had are with taxes decks and blood moon. Otherwise I’ve been completely destroying other Death’s Shadow decks with this list. 1 of tasigur has been excellent against the jund lists specifically. They typically just don’t have an answer outside of lili.